We guarantee to get you a Web Development job. It’s that simple. Do you want to kick start your Web Development career in Australia? Enrolling in job guarantee programs provides you with knowledge, skills, local work experience and career counselling to keep abreast with the rapidly growing web development field. Besides, gaining a core set of Web Development Skills by undertaking certification training in front-end technologies, back-end technologies as well as Project Management, real-world internship, professional resume and cover letter leads you with opportunities to get adjusted into the IT industry smoothly. We prepare you to become a Full-Stack Web Developer, hence ensuring you end up in a web development position of your choice and where you can get an opportunity to showcase the multiple skills that are required to be a successful Web Developer or an Application Developer. We aim to equip you with all the skills that you need to learn and apply to become a Web Developer. 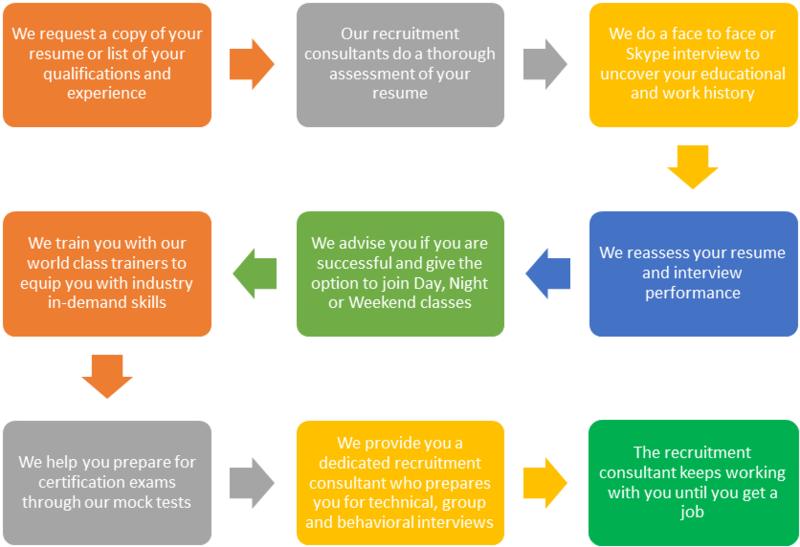 Our recruitment consultants have undertaken extensive research within the robust Australian web development and application development job market and based on their findings we prioritise the LAMP model in our Web job program. Our rigorous training sessions make these programs a must do for IT graduates, career changers, new migrants and people made redundant to help them make career advancements in the Web Development sector. Web Development job programs are designed that can be easily upgraded. The Web Development program job roles may include but are not limited to getting you a Web Developer, Application Developer, Analyst, Database Designer, Software Engineer, Systems Engineer, Database Administrator and other related jobs. Enrol Anytime: Web development job programs commence every week. Keeping in view the importance of certifications in Australian job market, the program includes hottest Agile, Microsoft, Oracle certifications with SEO and WordPress Training. All courses are instructor-led and fully hands-on, course material is provided for all courses, exam preparation, exam vouchers and pre-job preparation is included. Finally work experience is provided at Logitrain and guarantee three also lands you a Web Development job. What’s holding you back, enquire now and get the Web Development job you always wanted.